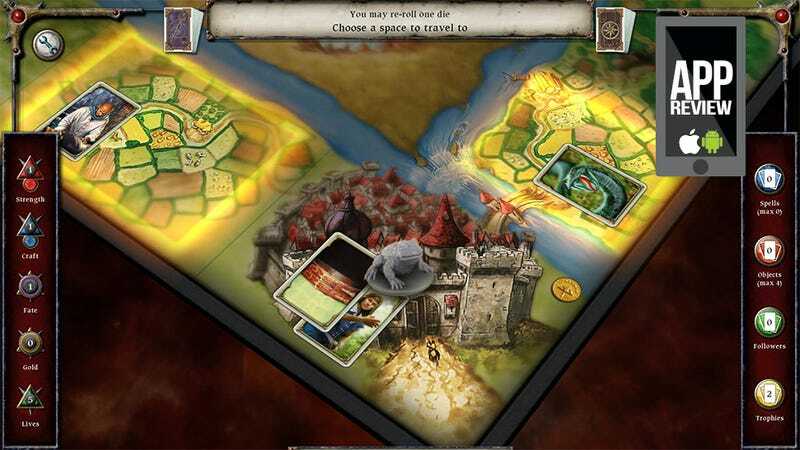 If Talisman Prologue is any indication of how the full version of the classic fantasy board game will pan out, then fans are in for a real treat when Talisman Digital Edition launches this summer. Until then, they can re-learn the ropes in this single-player boot camp. The board game Talisman ate up a great deal of my time and money in the late 80s - early 90s. The core game is a race to the center of the board to retrieve an artifact called the Crown of Command. Players take on the role of one of a number of fantasy archetypes, each with their own special skills and statistics. The board is littered with special events, cards are drawn, encounters are resolved through dice, items are bought — it's more complicated than checkers, but not quite Risk. What Talisman Prologue does is give players a board, ten characters to choose from (most of which must be unlocked) and a series of quests to complete on the board. It's still Talisman, with its gold and curses and followers and random battles, but instead of getting to the center of the board you're charged with taking out a group of bandits, or obtaining weapons — tasks easily completed by a single player. There are times the game's multiplayer-based mechanics falter — losing a turn hardly makes a difference when you're the only person playing, and being forced to drop your followers and equipment isn't so terrible when there's no one else to pick them up. Prologue is a little clumsy that way. But Prologue is, of course, a prologue — a taste of things to come. Once the quests are complete, players will have an excellent grasp of the game mechanics coming in the full multiplayer version this summer for mobile and PC. Talisman Prologue isn't the most faithful digital translation of a fantasy board game ever made, but it certainly suggestions that one's on the way.